Angeline’s staff and Bakery community are hitting the Wheatgrass hard in the New Year. The benefits of wheatgrass are numerous- live enzymes, vitamins, minerals, amino acids, and of course, Chlorofill which oxygenates our blood and keeps a spring in our step! 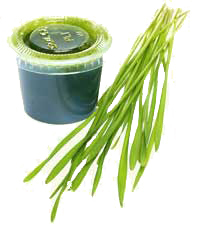 Liquid Sunshine– our local source for convenient frozen wheatgrass cubes for juices and smoothies! Posted by Angeline on January 3rd, 2012 in New in the Kitchen, Uncategorized | Comments Off on We are loving Wheatgrass! !